"No, not just yet brothers. The Prophets are quite interested in this object, and demanded that I personally oversee the operation. You may continue on and crush the humans. A Phantom is inbound with a Spectre, you may find a use for it." The Marshall replied. "May the gods guide you to victory." "My men can man the spectre." Ivea said, "We should continue as we have been." "Very well Brother." The Field Marshall said, promptly and suddenly cutting the comm. The Phantom quickly came in, distinctive whirring sound growing louder as it came closer. A red vehicle was held underneath in its grav-lift, which was quickly released. The driver's seat and Gunner's Platform were too tall for either Kig-yar(Jackals) or Unggoy(Grunts). The side seats, however, would carry them just fine. Sangheili or Jiralhanae(Brutes) were tall enough for both the driver's seat and Gunner's Platform, and both side seats would accommodate them fine as well. The Phantom then quickly pulled away, heading into the atmosphere and towards the CCS-Battlecruiser that had settled back into orbit. Two brutes and two Elites hopped into the vehicle and kept speed with the rest of the group. The Spectre sunk slightly under the combined weight, but quickly compensated for it. "Should we stick with you, or move on ahead?" The Minor in the driver's seat asked. "Stay at pace with the front of the group, unless Ivea has a different idea." 17dragonboy wrote: Asmi's unit followed the same formation as before. The shield bears were scattered in the lead. The snipers approximately fifty meters behind, scattered and loosely going from cover to cover. Asmi was about twenty meters behind the snipers, cover jumping similarly. "I'll keep my distance as usual, but stay with the rest of the group as commanded." Ivea said sternly, "Don't go off by yourself after every puny human." "Yes, Field Master." The Minor replied, moving the vehicle ahead of the group. The Brutes in the seats growled in disagreement with the order, but stayed put in the vehicle. The Spectre then held position 5 meters ahead of the group, ensuring that it would be the first to draw fire should anything come from the front. The Covenant troops and Spectre rapidly crossed the city, ending up three blocks away from the target building. Motion could be seen behind the windows, and a distinctive silhouette was seen. The humans in the building either hadn't seen the group yet, or were waiting for them. "A...a DEMON?! HERE?!" A Sangheili cried, fear obvious in his voice. He began backing up, before hitting a wall behind him and promptly stopping. "The humans shouldn't have this kind of power here! We cleared them out!" "Calm yourself." Ivea commanded, "It matters not what they have here, it is our job to wipe them out." Then turning to his fellow commander he asked quietly, "Do you think they've spotted us yet?" Does a demon refer to a Spartan and/or ODST? "I do not know. Let us assume they have. My snipers and I will spread out and surround the building. My shield bearers will distract them." Asmi and his snipers gathered behind one of the buildings, then engaged their cloaking devices. From there, they slowly moved to surround the building at their current distance. If their cloaking gave out, they would stop behind a building (in advance), and wait there until it recharged. Meanwhile, the shield bearers started a slow march forward in tight defensive formation, thinking about what cover to use if things got too dangerous. I feel like this strategy isn't going to work as nicely as I hope. I bet one of them is already lurking out at our radius, to attack us from behind. How exactly did cloaking recharging work? How long to recharge, namely. I imagine with five snipers (including Asmi), they'd be spread out like a pentagon. Asmi would be at the back of the building. There's still buildings and cover behind the target building, right? If one of the snipers dies, would everyone else know of it? And be able to act accordingly. If Asmi dies, can I still control my troops? Ivea followed suit and found some cover nearby before trying to get a better look through his sniper. The Spectre would stay back and patrol the area, trying not to draw too much attention to itself, while the rest would move up with the other shield bearers. OOC: You guys are in front of the building, for the record. Behind the building, there's very little cover. In front of it, there's still ruined buildings and whatnot. If you die, you can still 'order' your troops around. As mentioned, feel free to create another Elite as well. 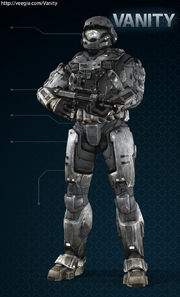 Demon does indeed refer to a Spartan, as ODSTs are commonly called "Imps" by lesser Covenant. This is an acknowledgement of the sheer destruction a Spartan/ODST can wreak on Covenant ground forces. Cloaking works by bending light around the user. It lasts 3 turns, and recharges in 5. Spec Ops Elites lose their camo when they lose shielding, but regain it when shielding comes back online. As long as you have 1 point of shielding or more, Spec Ops Elites retain their camo. Unless you see the sniper die, then no. Lesser Covenant (Jackals/Skirmishers/Grunts) are commonly used as cannon fodder, so don't be afraid to send them to certain death. They'll do anything to earn their Journey...usually. The shadows in the building began moving. If they didn't know the Covenant were there before, they did now. The Demon took cover behind a wall, disappearing from view. Motion caught Ivea's eye. Ten windows had been knocked out, and in their place were heavy mounted machine guns. Some were manned by human civilians, but six were in use by the ODSTs. The remaining ODSTs had retreated deeper into the building. There was little the Specter could do to avoid fire, and the maroon vehicle had definitely drawn attention. The guns in the building were tracking it, but had yet to fire. Ivea's Jackals were in the process of setting up positions with Asmi's. The snipers spread out along the cover, but not so far that the guys at the ends have a really hard time hitting targets. then there would be two to each side, including Asmi who would take the farthest. How does recharging cloaking work if it is shutdown before the three turns are up? Do lesser covenant have shields? While the snipers continued to get into position, the shield bearers continued slowly forward. They clung to cover, only moving once they located their next piece. A few times they fired some shots at the windows/machine guns, just to provoke the humans. Survival was their priority, however. Jackals/Skirmishers only have shield gauntlets, not full body ones. They're generally stronger than Sangheili Major shields, but only cover one direction. If they have a 2 handed weapon, they can't have the gauntlet too. Only Brute Chieftains have shields. All Sangheili have shields if they have their combat harness on. I'll wait for Sunfish before I continue. "Spectre pull back, with that much firepower it's not a good idea to be a large target." Ivea said before aiming a shot on an ODST. If they shot once, he would take the shot. The Spectre quickly reversed direction, and a rocket came soaring towards the Covenant vehicle. It managed to avoid the deadly projectile by getting out of range, but one of Ivea's Jackals was unlucky and got caught in the blast. The explosion picked the frail creature up and threw it against a building, killing it almost instantly as the concussive wave pulped the Jackal's heart and snapped its neck. The Jackal sailed away from the blast, landing on a shattered I-Beam from a broken building. The other two managed to get into formation however, making the wall of overlapping plasma shields longer, but not necessarily stronger. Two held them above their heads, to try and stave off bullets and grenades. Ivea took a shot at one of the ODSTs, the man on the gun avoiding death through sheer dumb luck. He had sneezed just as the Sangheili fired, and the beam cut through the ODST's visor instead of his head. The beam still injured the man, however, causing extensive second degree burns on the man's face. He yelped and dropped, clawing at his broken helmet. The remaining guns rounded on the shot location, a sheer wall of lead spraying the area. Ivea's shields took a pounding (-65 shield), only barely holding. In addition, Ivea's HUD displayed enough battery power for 6 more shots from the beam rifle. Asmi soon took a shot as well, which caused half of the guns to round on him. This time, however, the Covenant scored a kill. The particle beam split a civilian's head open, causing his corpse to simply flop over the gun. The Sangheili's own HUD displayed enough battery for 7 more shots. The Skirmishers with Asmi took shots as well, but they weren't as well aimed as Asmi's shot. As a result, several guns were damaged, but their occupants were unharmed. "This position is too well fortified." Ivea yelled to his companions, before backing up. "We need to at least flank them." Another missile came from the building, again coming after the Spectre. The driver attempted to evade it, but in his over-zealous attempt to get away, actually drove the vehicle into the high explosive projectile. It struck the Spectre dead-center, knocking out the shields on both Elites and killing the Brute in the side seat. The gunner retaliated, spraying hot plasma into the window the missile came from. The Plasma rounds struck the Spartan in the window, his shields glowing gold as they absorbed the plasma and protected the human beneath. The intensity of the glow indicated imminent failure of the shielding system. Ivea attempted to line up a shot on the Spartan in the window and would take a shot as soon as he could, however if he couldn't get a good shot he would retreat to better cover. The elites in the spectre would jump out and retreat, throwing down a shield to cover themselves as they did so. Is this still going on both ends (THG and Minegarde)? Ivea retreated for cover before he was struck and flushed out. Once it was safe, he would relocate and then resume sniping. His shield bearers retreated for cover as well, thick cover that ensured protection. Offense was not a priority for now. Since they had yet to draw attention to themselves, the other sniper's in Asmi's unit continued to spread out then begin sniping. Ivea's reticle blinked red, and the Sangheili took the shot. The particle beam slashed through the Spartan's weakened shielding and cut into the armor, burrowing through his midsection and out the other side. The Spartan instinctively flinched, but then proceeded to pick up a large, green weapon. The Brute on the Spectre's gun continued to fire at the building, heedless of the Spectre taking fire as well. Chunks of armor were quickly lost, and the vehicle loosed the occasional blue plasma flame. The remaining Covenant used the Brute as a distraction, retreating behind any solid debris they could find. Asmi's remaining marksman unit fired at the human emplacements, silencing three and damaging a fourth. Suddenly, the shooting stopped. The human guns fell silent, and aside from the Spartan in the window, no motion could be seen. The snipers in Asmi's unit hid behind cover to thoroughly conceal themselves, then disengaged their active camouflage to let it recharge during what was hopefully downtime. Asmi himself, however, continued to look over the area for targets. The shield bearers maintained their positions behind cover. Ivea slowly repositioned himself, careful not to give away his position by moving too fast. The brute in the gunner seat would continue to fire at the spartan while the elites and lesser covenant would take cover behind anything they could and get out of sight. The Spartan in the window took cover, and the Spectre's gun missed as a result. The bolts hit the wall inside the building, causing the metal to glow a dull yellow, but caused no further damage. The sniper unit saw no further motion, the Spartan himself staying out of sight. Asmi continued surveillance over the building, while his snipers remained concealed behind cover and allowed their cloaking to recharge. The shield bearers remained hidden as well, taking a look at their flanks and rear. No motion was seen. It appeared the humans inside had gotten wise to the scheme, and refused to poke their heads out. Even the exposed Jackals and Spectre drew no fire, though the Spectre's gun continued to rain fire into the building's upper floor. The turret's barrel looked ready to slag itself. BizzarreCoyote wrote: The turret's barrel looked ready to slag itself. Can you clarify what that means, please? Namely who's turret and what exactly slagging entails. Also, status on snipers' camouflage units recharging? Can the enemy have cloaking units? Asmi grew nervous about the situation, because the humans may have been plotting something, or something unseen could have been going on. Regardless, he continued to look for targets. If he took a shot, he would quickly take cover after. The shield bearers remained behind cover, and the other snipers remained hidden. Slag: Reduce to a warped, melted lump of metal. Seeing as the Spectre is the ONLY ONE SHOOTING, who do you think that applies to? The cloaking units have 2 turns left, and yes, the enemy can have them too. Ivea ordered the brute to stop firing until movement was seen so as to not waste firepower, then had the rest of his unit move to cover a bit closer to the building with the humans on the lookout for the slightest bit of movement. OOC: Apologies for the angrish the other day, I was in a really bad mood. The Brute snarled at the Ivea, but ceased firing. As before, no motion was seen. The Jackals and Grunt moved up, but didn't draw fire. Asmi's patience started to thin, but as a sniper, he was supposed to be patient. He remained where he was and continued to look for targets. The other snipers remained hidden. Deciding to wait things out just a little longer, the shield bearers remained hidden as well. I'm just waiting for something terrible to happen to us. Something we'll go "how did we not see that coming?" to after. Though, the others are probably thinking the same. It seems to be a game of who's patience wears out first. The Spartan suddenly appeared, dashing across the hallway and into a room that was out of sight. The Brute fired, striking the Spartan once and causing his shielding to flare a golden yellow before the human disappeared again. He was moving much too quickly to get an accurate shot on with the rifle, so Asmi held off. No other motion was seen after that.